Newcomers to the state have a lot to offer, but their accomplishments are too often overshadowed. Maine’s immigrant population has been the subject of great political debate for the better part of two years now. Unfortunately, the conversation too often has been dominated by the loudest and most reactionary segment of the state. We hope that can change with the help of the New Mainers political action committee. 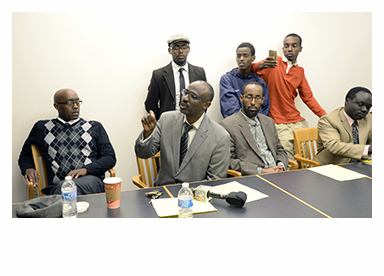 Representing immigrants from a half-dozen countries, including the Democratic Republic of Congo, Somalia and Sudan, the group formed earlier this month with the intent of presenting a unified voice for the state’s residents who were born abroad. It is imperative that they, along with other immigrant advocacy groups, rise above the clatter and tell the real story of immigration in Maine, and lay out a compelling narrative for how immigrants can play a significant role in creating a vibrant state. The subject will certainly be on the table. The statewide discussion has brought one unfair and inaccurate statement against immigrants after another. They have been painted as welfare cheats who are soaking up state resources, or as a possible security risk. They have been told they are unpatriotic for not staying to help in their own war-torn countries, where many were facing persecution or worse. And they have been the center of a fight where one side wanted to take away the assistance that provides immigrants housing when they first arrive and by federal law cannot work. The debate about general assistance for asylum-seekers, and thus the overall debate over immigrants, will continue, as the Republican Party is collecting signatures to place the issue on the 2016 ballot, along with other tax and welfare reforms. Backers of the initiative can argue that Maine cannot afford such a wide safety net. We disagree, and believe that it is in the state’s best interests to embrace immigration, for the sake of its workforce and the benefits of diversity. But it’s a fair argument. What’s not fair is to capitalize on the most xenophobic Mainers by using unsubstantiated or unrepresentative stories of immigrants to push for the denial of assistance. That’s where the New Mainers group comes in. Members need to tell the true story of Maine immigration, the one where those coming here are in their prime working years, helping bolster a workforce that is shrinking and aging. They need to show how more than 18 percent of immigrants to Maine have a graduate or professional degree, almost twice the percentage of U.S.-born Mainers. And they need to tell personal stories about how they got to Maine, how they feel about their community here, and what they hope to do to help build it. That way, when Mainers go to the polls next year to vote on general assistance for asylum-seekers, or any time Maine’s new immigrants enter the conversation, residents have more to go on than the misleading blather of the narrow-minded.